An honours graduate of the Scottish Music degree at the Royal Conservatoire of Scotland, Claire specialized in Scots Song with expert tuition from Gordeanna McCulloch (The Clutha) and Rod Paterson (Jock Tamson’s Bairns). 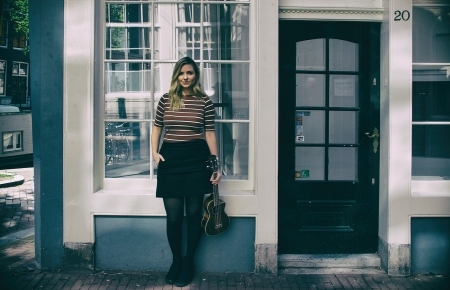 Since graduating, Claire has toured successfully in the UK, Europe and New Zealand as a solo artist and with The Claire Hastings Band, and has performed at international festivals including Festival Interceltique de Lorient and Celtic Connections. Standout performances also include BBC Proms in the Park with the Scottish Symphony Orchestra, singing alongside Lulu, Jamie Cullum and Deacon Blue at Glasgow’s City Halls and collaborating with soul singer Joss Stone for a video. Claire’s debut album ‘Between River and Railway’ was released in 2016 her much-awaited second album ‘Those Who Roam’, launching at Celtic Connections 2019, features traditional and original songs under the theme of journeys.